Egismoz franchise business opportunity. Free Egismoz business franchise information. Through its Buying Group, egismoz has access to billions of dollars of name brand closeout, overstock, and manufacturer-recertified electronics. egismoz™ taps into this huge demand for consumer electronics through a unique clicks and mortar approach that combines the advantages of a retail setting with the reach of the Internet to sell value-priced electronic gismoz and gadgets. egismoz stores are located in easily accessed, community-oriented strip shopping centers. 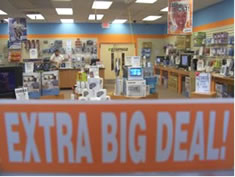 They offer customers the opportunity to see, touch, test, and purchase brand-name electronic gismoz and gadgets in an easy to shop 2,000 to 2,500 square foot space. egismoz online component, egismoz Auctions, offers a second income stream where buyers bid on a host of consumer electronic products that are available at their local egismoz store. At least $75,000 in liquid assets to invest. Personal net worth of at least $450,000. Retail experience not necessary, although always helpful. To learn more about the Egismoz retail franchise opportunity simply complete the form below.